This set of Concrete Technology Multiple Choice Questions & Answers (MCQs) focuses on “High Strength Concrete”. 1. What could be the possible answer among the following for compressive strength of high strength concrete? Explanation: High strength of concrete has the compressive strength greater or equal to 40MPa. 2. What could be the possible answer among the following for water cement ratio for high strength concrete? Explanation: High strength of concrete made by lowering the water cement ratio nearly equal to 0.35 or less. Explanation: Due to low water cement ratio, it causes problems so superplasticizers are used. 4. Which type of aggregates are used to produce 70MPa compressive strength? Explanation: To produce 70 MPa compressive strength, coarse aggregates are being used in HSC. Explanation: Maximum size of aggregates is 20-30 mm are used to produce 70MPa compressive strength. Explanation: Maximum size of aggregates is 10-20 mm are used to produce 100MPa compressive strength. 7. “In bridges, HSC is used”. Is it true or false? Explanation: In bridges, HSC is being used to reduce the number of beams for supporting span. Explanation: Use of HSC in column section decreases the size of the column and used in high rise buildings. Explanation:Use of HSC in column, decrease the number of steel required in the same column. Explanation: High strength concrete is defined purely on the basis of its compressive strength. 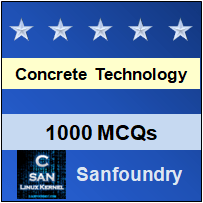 To practice all areas of Concrete Technology, here is complete set of 1000+ Multiple Choice Questions and Answers< /a>.